Growing up, my family always watched figure skating during the Olympics. Our first family dog was named after a figure skater (that I was too young to remember but thanks to Youtube I was able to watch some of her performances!) It was during the 1992 Olympics, though, that I really fell in love with the sport. I remember watching it obsessively throughout, learning the stories, cutting out the pictures of my favorite (Kristi Yamaguchi) from our newspaper and hanging it up in my room. And Paul Wylie's medal is of course one of those epic sports memories I'll remember forever! This started my love of figure skating--a sport I followed pretty closely during the 90s. I remember the Nancy Kerrigan and Tonya Harding incident, of course I do, but I didn't realize at the time that it made figure skating more popular than it had been. I think because at that point I'd been a fan for a couple of years, and I was still young and didn't really remember the before period. What I do remember is that you could often turn the TV on and find skating on the weekends, that when your favorite skater retired it wasn't like you lost them forever because there were these other competitions and they were more fun with cooler costumes and lights and music. And I remember Michelle Kwan, thinking she's the next big one! even when she was still so young and just the alternate on the '94 Olympic team. I even thinking skating is the first thing that sent me online in search of fellow fans. But you know life. Life happens and eventually I became a "watches skating during the Olympics" sort of fan. Plus, the 2002 judging scandal happened and the scoring changed and when I watched the Olympics in 2006, I was like WHAT. And then 2010 was a year full of personal upheaval and I think I vaguely kind of sort of remember watching the ice dancing and that was it. All this to say, when I casually thought it might be interesting to brush up on figure skating for the 2014 Sochi Olympics, I had no idea how much the sport had really changed. I have a friend who likes it, though, and she started filling me in on how there was no more pro circuit, and skating was barely ever on TV, and we are actually STRONG in ice dancing, and stuff like that which really piqued my curiosity and sent me to do some research (aka googling). 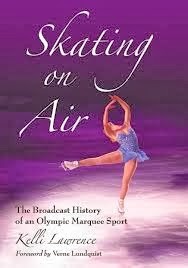 I stumbled across this book Skating on Air which is about the history of figure skating as a broadcast sport and it promised to discuss the decline of broadcast coverage, etc. so I bought the ebook and started reading. And...I really loved it? Like, it was completely and utterly fascinating to me to have the story and evolution of figure skating as a broadcast sport. Like, I knew some things from when I was a fan when I was younger, but this was the first time I felt like I was really able to see how it became popular and how viewership changed and impacted the sport (a lot) and who were some of the key players and even things like the difficulty of broadcasting it. I enjoyed all of it, but I admittedly raced through the section of when I became a fan to present because that has more personal resonance for me! So it was really sort of amazing to learn that the 1992 Olympics gave the sport more coverage than ever before and to understand how the Nancy Kerrigan incident created a lot of opportunities and that the sport just exploded in popularity during that time and I was just one more part of that. Also, Michelle Kwan was a huuuge star and we don't really have a star like that now, THOUGH WE TOTALLY COULD WITH THE ADORABLE DAVIS/WHITE if we cared. Anyway, I stayed up late a couple of nights reading this book, it was just that compelling! It's an interesting story/history of skating in the United States seen uniquely through the eyes of broadcasting. I think, of course, it helps that I loved skating and that it was a big part of my life to be a fan when I was young--and that I've really enjoyed trying to follow it this year as well. I don't think I'll let the sport go again now that I know how to follow it and I'm so glad it's part of my life again. But even if you aren't a fan of skating, you may enjoy reading the book anyway if you're a fan of sports or sports broadcasting because it really is very interesting!